Thinking what to do with leftover naan? Make Naan Pizza. 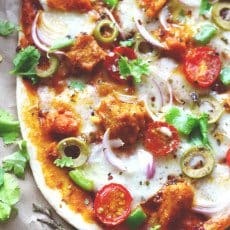 You will surely thank me for this easy naan pizza recipe. Last week, we had a dinner party and guess what, due to some last minute cancellations we were left with extra butter chicken and naan bread. And the next day, butter chicken naan pizza was our quick dinner. 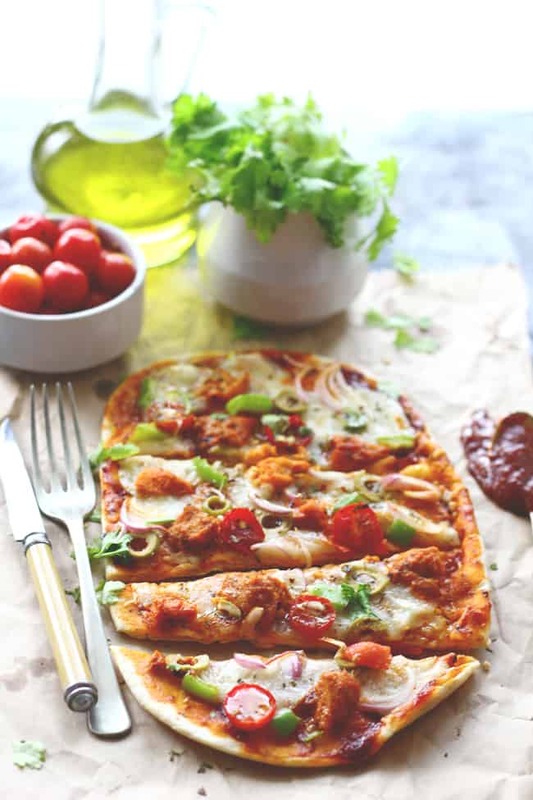 Naan pizza layered with rich tomato sauce and topped with butter chicken tastes simply divine. Don’t be stringent while adding cheese, after all, pizza tastes so much better with extra cheese. The combination of butter chicken and cheese is a guaranteed riot of flavors. This particular naan pizza is phenomenal because it has two of my favorite things – first butter chicken, I adore butter chicken. Secondly, super thin and crisp crust. Why is it so amazing? Well, actually, I think I know why (crispy outside, soft inside). First, for the base, you can use ready-made naan. Second, any good pizza/pasta sauce is perfect for this recipe. Third, if you do not have butter chicken on hand, then add sliced seekh kebab, chicken salami or leftover pieces of tandoori chicken (they all taste equally good). And the fourth one, skip the veggies if you are too lazy to chop them, just add sliced olives and cilantro. I am sure with these cheat pizza making tricks under your sleeves, easy naan pizza could be your 30-minute dinner. I love such recipes which come together in less than 30 minutes and look super fancy on the dinner table. What do you think? Seriously, I’ve tried hundreds of pizza recipes, and this one is now absolutely up there on my top favorite list. 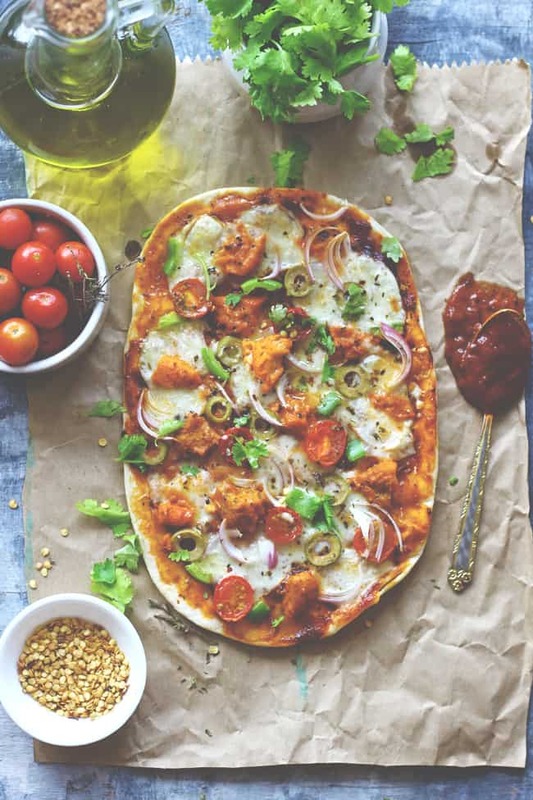 Something about that thin, crispy base and creamy, crunchy topping could make you addicted to this easy naan pizza recipe. Learn how to make easy naan pizza in few simple steps. If you make this recipe, be sure to snap a photo and hashtag it #funfoodandfrolic on Instagram. I’d love to see how your pizza look! Thinking what to do with leftover naan? Make Naan Pizza out of it. 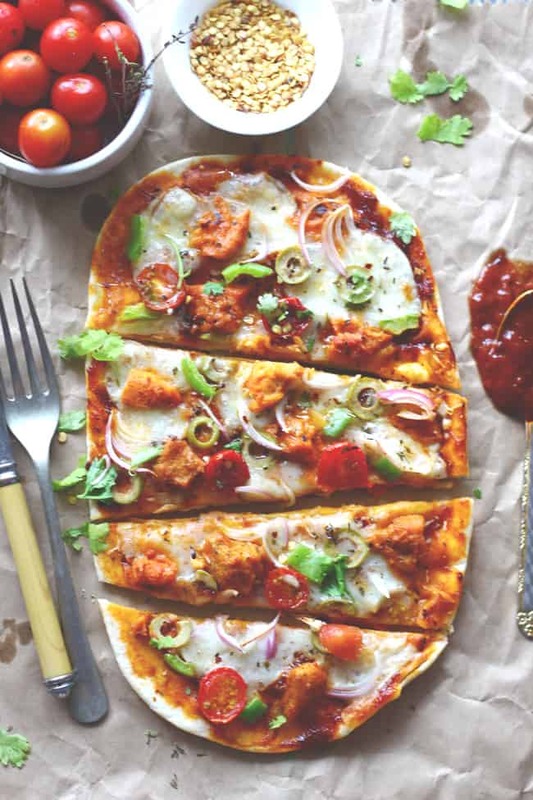 You will surely thank me for this easy naan pizza recipe. Next we need shredded or chopped butter chicken ( see recipe here ) pieces or any other roasted Indian flavored chicken pieces. We prefer butter chicken as it has subtle flavor and mild spices, perfect to blend with cheese. I love a good pizza recipe! This looks tasty, thanks for sharing! 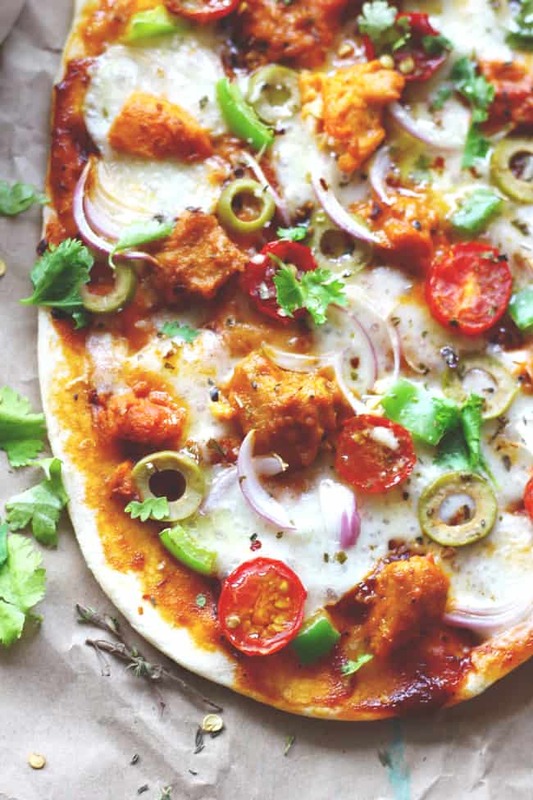 I recently posted a butter chicken pizza recipe to!Love them!